The Anderson Center at Cincinnati Children’s is actively engaged in developing researchers and leaders to transform pediatric health and healthcare delivery. To that end, we created the Anderson Center Leadership Academy to focus on building improvement capability both here and outside our medical center. Through a variety of educational programs, academy participants become powerful change agents, imagining more effective ways of practicing medicine and improving outcomes. Our goal is to create rich intellectual experiences and programs for the exchange of ideas to produce the next generation of leaders who will accelerate the transformation of health and the scholarship to support it. Results orientation: Building improvement capability at Cincinnati Children’s will go beyond acquisition of knowledge and skills to action-oriented improvement that achieves critical results and accelerates transformation. Daily improvement: All members of the organization will incorporate improvement into their daily work and have the ability to advance their improvement knowledge and skills to achieve critical results and function at any level of the Cincinnati Children’s improvement ladder. Focused training: Different groups of people have different levels of need for improvement knowledge and skill, and each group will receive the training it needs, when needed and in the appropriate amount. 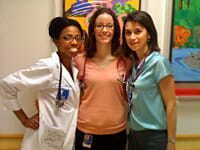 High-quality scholarship: As an academic medical center, Cincinnati Children’s will follow a strategy for building improvement capability that includes engaging and developing faculty as improvement leaders, educating trainees and advancing the scholarship of healthcare improvement through rigorous methods and quality-improvement research. To support these beliefs, we have built a full range of learning experiences. They begin with basic on-line modules and extend through a postdoctoral Quality Scholars Program. Though only Quality Scholars and Advanced Improvement Methods are open to external candidates, our intention is to expand the programs beyond our faculty and staff. Download knowledge sharing opportunities at Cincinnati Children's, including our daily operations briefs, webinars and open houses.